You probably all know the three famous internal martial arts - Taijiquan (Tai Chi Chuan), Baguazhang (Pa Kua Chang) and Xingyiquan (Hsing I Chuan). But now there is a new kid on the block of Internal Martial Arts - Yiquan (I Chuan) - Mind or Intent Boxing, that has been steadily gaining popularity in China since about 1940's and is now spreading across the world. Yiquan (pronounced yee-chwen), sometimes called Dachengquan, is both an excellent martial art and a very effective system of health cultivation. 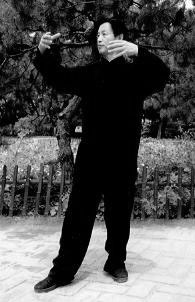 Most of us know some Yiquan because most Taijiquan styles incorporate one or several forms of Zhan Zhuang (Pole Standing) in their training and Zhan Zhuang is the main training tool in Yiquan - both at beginners and advanced levels. Yiquan was created by Wang Xiangzhai (1885-1963) from the best Martial Arts that he could find in China at that time. He originally called his art Yiquan - 'Yi' means 'mind' or 'intent' and 'quan' means 'fist' or 'boxing' - to emphasise the importance of mind in his system. In 1940s he dropped the name and called his art simply "boxing". He felt that having a name would constrain the art and stifle its development. However, following the success of Yiquan in Martial Art challenges, a new name started to be used - Dachengquan (Great Achievement Boxing). Wang Xiangzhai opposed the new name but eventually resigned himself to its use. However, he later reverted back to the name Yiquan. Students from the middle period still use the name Dachengquan. Wang Xiangzhai held quite controversial views about martial art training and held methods of other schools in low regard. He was quite outspoken and thus there was no shortage of challengers who wanted to test the newcomer. Wang Xiangzhai stipulated that any challenger had to defeat one of his top four students first. The four students were Han Xingqiao, Hong Lianshun, Yao Zongxun (Wang Xiangzhai's eventual successor) and Zhou Ziyan. No one succeeded and Yiquan quickly gained a reputation for producing excellent fighters (and later on for its health benefits). Wang Xiangzhai himself came to be very highly regarded by fellow martial artists and gained a universal respect both for his abilities and for the art he created. Yiquan is designed in such a way that you can progress in clearly defined steps. First you learn how to unify your body to acquire whole-body strength. You combine this whole-body strength with skills for handling opponents, which develops Internal Power. This can then be applied to fighting applications. 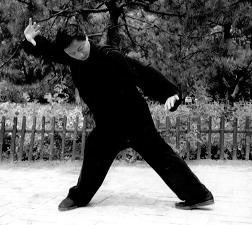 There are stages in Yiquan training that parallel other Internal Martial Arts, such as Taijiquan, but since Yiquan is simpler, these stages are perhaps more clearly defined. The first requirement is to integrate the whole body to achieve whole-body strength. Next the student has to learn how to move with this kind of strength in a fixed stance and with steps. After moving solo, the student learns how to use it in interaction with an opponent - Pushing Hands. The next step is to learn how to issue power in a single instant - explosive power training. As a supplementary training to the issuing of strength, breath control is learned. Lastly, for those interested in fighting, there are combat training drills and sparring. At all stages of training, students must try to follow the most important principle - Use mind, not strength (yong yi bu yong li). The health stances represent the first training step, even for those interested in combat only. Their role is to relax the body and develop whole-body connection. This means that a movement in any part of the body can be felt to propagate through the whole body in a natural fashion. In addition to standing postures, there are also sitting and lying down postures. The combat stances are used to develop whole-body power. At this stage, students attempt what is called Mo Li (Sensing of Strength) which are very small movements guided by the mind. Use of the mind in Zhan Zhuang is very important and very precise as it creates the foundation for subsequent training. Mental imagery is used to create a tranquil state in your mind, which, in turn, will promote relaxation of your body. Another kind of imagery is a creation of kinaesthetic feelings to promote the emergence of internal connections in the body. These are quite simple exercises designed to teach how to maintain the whole-body connection and whole-body strength whilst moving. Slow and flowing movement is used, quite similar to the quality of movement used in practising a Taijiquan form. In fact this type of practice is functionally equivalent to form practice in Taijiquan. Six directions of power are practised - forward & back, up and down, left and right. The moving in Shi Li was performed in a fixed stance. In this practice, students learn how to keep the whole-body connection whilst stepping. That is why sometime this practise is called Shi Li for legs. Once the stepping is learned, the Shi Li can then be performed with steps. At this stage, students learn how to 'release' power (fa-jin training) - how to generate explosive power. There are exercises for using feet, knees, hips, back, elbows, shoulders, hands, head - in fact (nearly) any part of the body can be used for attack or defence in any direction. This stage is similar to Pushing Hands in Taijiquan. There are Single and Double Pushing Hands, stationary or with steps. The purpose is to learn how to keep the whole-body strength and use it to manipulate an opponent. Students learn how to control the centre and how to sense and neutralise opponent's power. Though Pushing Hands can include elements of Fa Li practice, it is not combat training. This is additional practice for Fa Li (releasing strength) whereby the power that can be produced is augmented using breath control. Until now the breathing was soft and natural. Now the centre of the body is strengthened by learning techniques to increase abdominal pressure. This stage is called Testing of Voice rather than Testing of Breath because in the initial stages voice is used during the training to indicate how breath is used. Those students, who wish to learn fighting, learn and practice fixed and free sparring drills and sparring. There are some auxiliary training exercises designed for periods when a training partner is not available to train application of power and similar. Most posture and musculo-skeletal problems seem to be caused by an imbalance between muscles that stabilise our joints and those that move them. The initial training in Yiquan, Zhan Zhuang, is very beneficial for these types of problems as it re-educates the body to use the right kind of muscles for each task. There are other benefits stemming from the emphasis on tranquillity and very slow and careful movements. It obviously helps with any stress-related problems, and problems with co-ordination and balance. It is an excellent method of regulating one's metabolism and sleep pattern. More information on Yiquan can be seen at http://www.yiquan.org.uk/. There is a discussion page there where you can ask questions. We have invited Yao Chengguang (son of Yao Zongxun), who is the President of Beijing Yiquan Association, to come to Great Britain. He will give a number of seminars on different aspects of Yiquan in August and September. For further information, see the above web-site or contact me on 01344 772136.